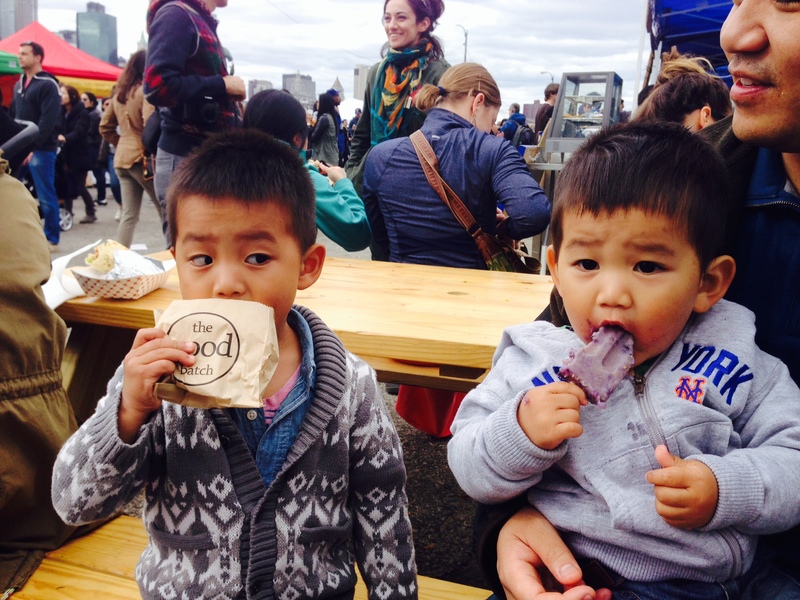 We rolled to Smorgasburg in Brooklyn Bridge Park on Sunday after church. About 100 food vendors. 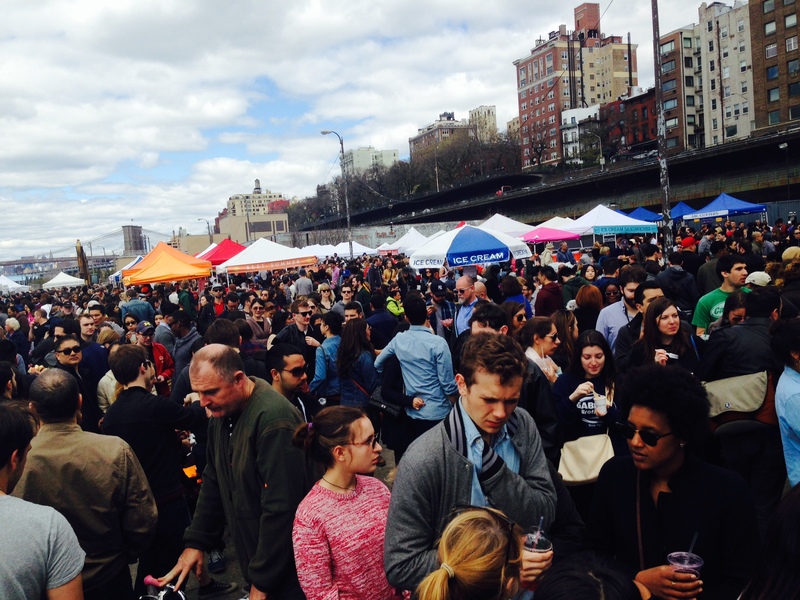 Always nice to enjoy the waterfront and milder weather with, well, a smorgasbord of savory and sweet to nosh on. The downside is that food “fairs” like these are deceptively pricey. You don’t think about it because you’re not going to a fancy sit-down restaurant with cloth napkins. You think that because you’re eating standing up, outside, from makeshift booths, you’re feasting on cheap eats but as you leave, strolling the kiddos on the cobblestoned streets of Brooklyn to your car, you come to realize that you paid $9 for six, tiny lumpia, $6 for an ice cream cookie sandwich, and $3.50 for a blueberry corn popsicle, just to name a few. And you ain’t exactly full. As usual, I ended up chitchatting with people among the crowds, asking people what they were eating and if it met up to the hype. Met a Chinese-American dad and his mom, with four kiddos and two cousins who are now living with them. Talked to a couple mamas with their double strollers. The most memorable part of the food frenzy was when we sat down briefly at a picnic table to feed the boys. We ended up sitting next to an older couple who was doing work. The grandma, her chicken and waffles, and the grandpa, his fish n chips. It was a whole fish, fried, tail and all. The line for the fish fry was absurd so I asked him if it was really that good. He was going to town on them, his hands full of fish juice and accompanying herbs. I said, “Oh, no, you don’t have to do that! I don’t wanna take your food…” but he wasn’t gonna play this game. And I got my taste of the deep fried whiting. I sat there for a few moments, taking in the sky, the crowds, the music, the water. Even though I am now a parent myself, I think there will always be a vacuum in my heart, hovering around or encased within the God-shaped one, to be loved DEEPLY by my parents. I KNOW they love me so much, but to be able to bawl into their bosom/chest and feel the love of a mama/papa bear for her/his cub. This isn’t something I consciously think about daily as I Mama Bear my own cubs but once in a while, as I fall asleep at night, or wake up from a vivid dream, oh, how I long to bare my soul to my earthly parent and be truly seen, heard, accepted and prized. Kevin has noticed it in more recent years as my dad has become less and less accessible, spending more and more time overseas just to cobble together some income in his twilight years. Kevin said that I seem to be yearning for the love and guidance of a father, and that sometimes, even when he is loving me as best as he knows how, as a best friend and husband, I seem to be looking past him, searching for that fatherly love. Me, too. I don’t plan to and it’s just in spurts here and there, not whole life stories a la Forrest Gump but I do like these micro-connections. Thank you, kind sir, for feeding me that fishtail. It hit the spot. This entry was posted in musings, you got me feeling emotions and tagged I miss my dad, searching for a father's love, you fed me fish by ajummama. Bookmark the permalink.